Looking for the best Cross Country Skiing trails around Weiser? Find the top rated cross country skiing trails in Weiser, whether you're looking for an easy short cross country skiing trail or a long cross country skiing trail, you'll find what you're looking for. Click on a cross country skiing trail below to find trail descriptions, trail maps, photos, and reviews. This is so worth while to ride. We started in Weiser, rode to Cambridge. Then stayed at the Frontier motel and finished with the ride to New Meadows. The trail the first half is gravelly, be ready for that. We also slimed our tires and only had one flat that sealed up right away. The second half to New meadows is a better trail and so gorgeous. The wildflowers are amazing and the animals we saw, deer, foxes, bunnies, turkeys, chukkars and lots of birds. You can get a shuttle thru frontier motel. They bring your vehicle to the hotel so you can pack what you need! Don’t eat at Ginny’s in Cambridge. It’s horrible. Mundo Hot springs is not so great either. Just a warm pool to soak in. I don’t think it’s the real deal actually. Record heavy snows and the resulting above average run off have closed most of the trail. As of April Only eastern most 9 miles remain open. 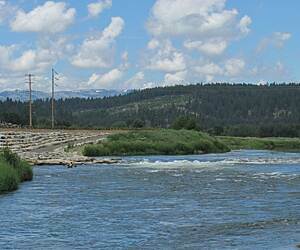 Federal water managers predict above flood stage releases into June. Check City of Boise website for closure maps. 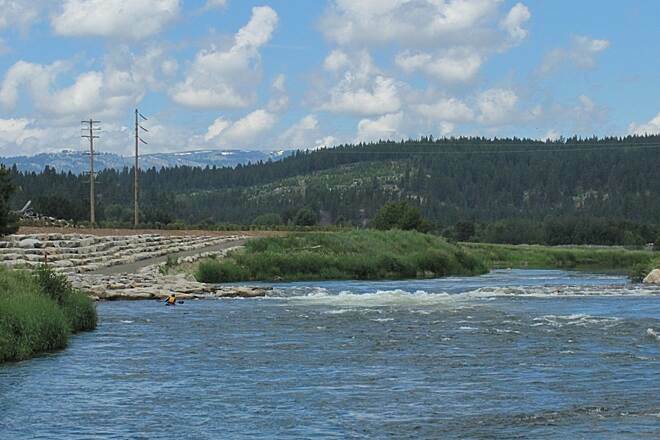 A key bridge between Boise and Garden City has been removed to save it from falling in the river and park managers say it will have to be relocated. 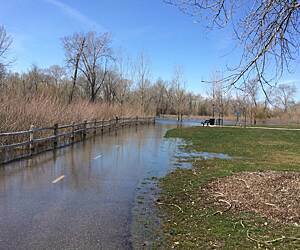 Thus when flooding subsides you will not be able to ride the trail from one end to the other non stop. When it dries out it is still a great trail you will have to ride part and find the detour around the missing bridge to continue on. Three of us rode almost the full length of the trail on October 8 & 9. Weather was perfect. We rode downgrade from north to south and overnighted at Mundo Hot Springs, strategically located at the midway point. Sophie the owner is awesome and prepares delicious meals. And, nothing better than a hot soak after a 40 mile ride. We saw very few others and dont think any were doing the full length. The trail is a mix of everything from a few paved sections to some areas that were a little muddy. Rocky seems most prevelent. Id say to do the full length, fat tires and minimum of weekend warrior level fitness are required. Most upper section is evergreen type and then gets into open high desert type terrain for say the lower 80% of the trail. Summer riding in the exposed sun would seem pretty rough to me. The ten or so miles from the Presley Trailhead to Weiser were probably the least scenic, mostly farm fileds. Saw a good bit of wildlife including a bear at a safe distance and some mountain sheep foraging on the side of a steep hill. While we were prepared for goatheads, none of us had a flat tire (thankfully). This is a neat trail (underutilized) that folks should enjoy. 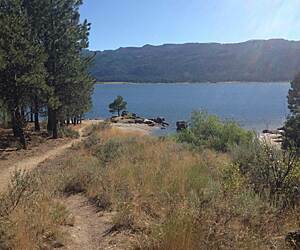 Rode this trail from Eagle all the way to Lucky Peak reservoir over 2 days in late September. A great experience overall. Suggestions would be for a bit better markings along the route, as the downtown areas can be a bit confusing and congested. The only negative is a local weed called goatheads....nasty little things that resemble organic thumbtacks....flattened 3 of 4 tires late one afternoon. Advise you carry a tire pump!! We traveled this trail in July from Cambridge to Council, with the ambition of going as far as Starkey then back to Council. While fortunately the day time temp was not as warm as it could be (like 100), the sun still beats down on us as there is limited shade. Once we hit Council for a break in the shade to cool off, we decided that we were done. The trail is peaceful, and the grade is easy. The trail surfaces did vary from compacted to very loose, so one does need to keep one eye on the terrain. You must also watch the surroundings for wildlife as we did enjoy what we saw. We traveled 20 miles of the tail and did not see any other riders. We stayed at the Mundo Hot Springs in Cambridge. We jockeyed a truck up to Council so that we'd have a way back to the RV Park. We enjoyed the hot springs that evening! My husband and I just rode 30 miles of the Weiser River Trail. Our friend, Bob Patrick, dropped us off at Midvale and we rode to Weiser. We took our mountain bikes since it is a gravel and slightly rocky road. The trail had been smoothed out and in good shape although our legs and behinds, a little less so! We enjoyed starting out in the farm country with the snowcapped mountains in the background and then made our way into the amazing canyon that hosts the Weiser River. Spring is a perfect time of the year, the canyon was green and lush with twists and turns and the river in full flow. While we didn’t see any other wildlife, the river was full of duck and geese playing in the river. About the time our legs and rear ends needed a break, we came upon a bench and picnic site near Concrete. That was great, a nice resting spot! No latte stand;) but we made do! Along the trail there are railroad trestles that marked your mileage so you had an idea how far along you are. After Presley, we left the canyon behind and the last 10 miles or so we were back in the farm country. Our legs and behinds were very glad to see the Weiser trailhead, thirty miles later! It was a great experience and would highly recommend it. A rider does need to have enough food and water and a tire repair kit. Between Midvale and Presley when you are in the canyon there isn’t any services or cell service. We would highly recommend it and looking forward to trying the northern trails later in the spring. I ride this trail daily May through October back and forth for 10-15 miles. It isn't very crowded so I can open up and ride without many obstacles. The scenery and wildlife which I encounter daily adds to my experience! The only thing that I don't like is a very short section of loose gravel in front of the whitewater park amphitheater. Other than that it is a great trail of asphalt and hard packed dirt. For people staying at Arrowhead RV Park there is a trail that goes under the south bridge that connects with The Strand so you don't have to cross Highway 55. There is also a side spur about midway on the main trail that leads into town which makes it nice to avoid riding on the main highway to get into town. I have been biking on this path for 16 years and love it! Cool biking experience with grandsons. 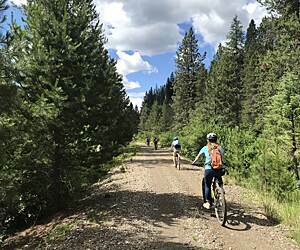 Biked this trail from Evergreen campground to Council last week with my 14 year old grandsons. We dropped off my Honda 110 trail bike in Council for a shuttle vehicle and proceeded to campground for overnighter and started down trail at noon next day. Awesome experience riding about 18 miles through forest and over numerous rail trestles crossing Weiser River. Stopped about half way so boys could take a dip in river. This stretch of the trail can compete with any trails I have seen pics in brochures. Plan to do it again with older buddies (senior citizens) in near future. Safe in the rail bank. First rode downhill from Tamarack, about 10 years ago. The bridge decks weren't finished then, so if you turned your bike sideways, the pedals stuck out far enough it wouldn't fall through the gaps between the timbers. I figured the trail needed to be finished. Fast forward to today. Started in Council, going north, ten miles up & then back. The trail is a gravel doubletrack after the first mile. Mostly a firm roadbed, but at ranch road crossings, there's enough broken rock gravel to replace your front yard, that is: barely rideable. A horse would walk around that. And the gates, couldn't ride for ten minutes without another livestock gate. What did the cattlemen do when the trainmen didn't stop their train every mile or so for a livestock gate? I can't imagine that they did. Solitude was great, I'm no backwoods tracker, but the dust on the trail said I was the only bicycle through there since the last ATV's rode through. Another reviewer wrote that they need to pave this. 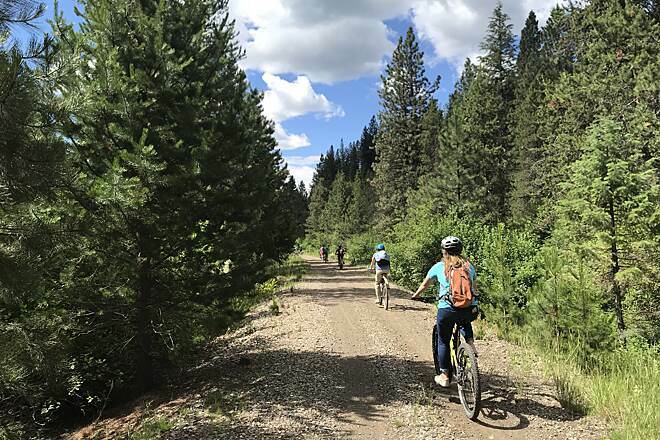 I don't think these Idaho counties would spend to do that, but, it's about the only way I can think of to reconcile the overall length of this trail with the recreational intent. A harsh, hard, trail in a very pretty valley with all the potential to be a premium cycling destination. 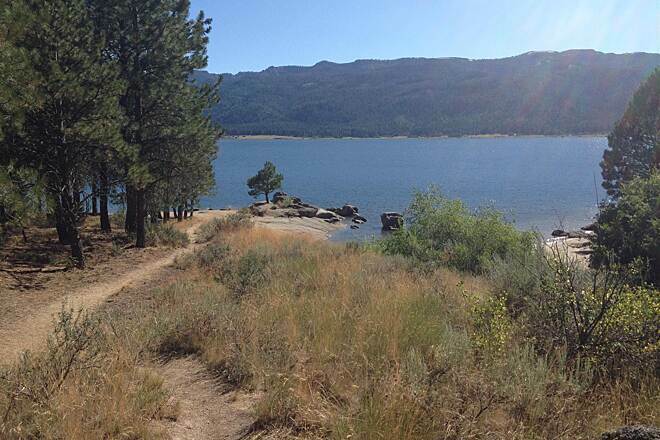 This is a great, long trail that takes you through varying landscapes. The trail itself has a variety of surfaces. There were some rocky stretches, but nothing we couldn't plow through with some effort for a mile here or there. Unfortunately, because of logistics, we rode it during a 100+ heat-wave in early July. We recommend going during more moderate temperatures. We were happy to have showers and camping at Mundo Hot Springs. Also, happy to have a willing shuttle driver from Colonial Motel in Weiser. We highly recommend those two services for overnight and one-way bikers. 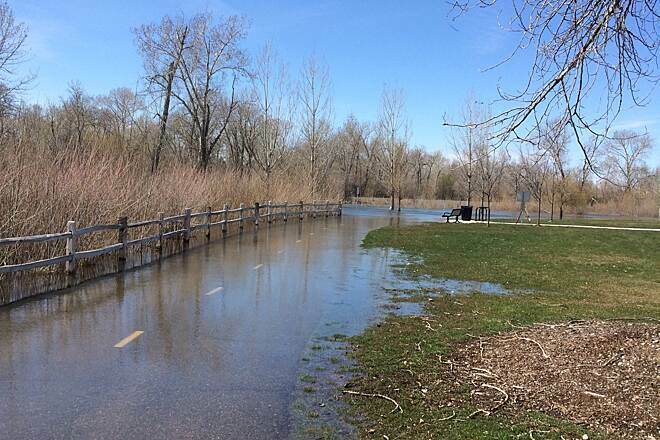 Have been looking for a good map of the Boise Greenbelt, but this is not it, Yet. It is a good start but missing the trails that run on both sides. It could also add bathrooms, air pumps, water coolers along the way. It would also help to display mileage marks. April, 2015 by ron h.
This 85 mile long trail is a wonder to see. It will take you thru just about every type of country side that you could imagine..... from the high prairies, lush farm lands to the forested mountains. But please don't expect an easy trip or a Sunday stroll in the park. This trail can be demanding with long distances between towns. So be in good riding shape and be prepared with plenty of water and the ability to fix a flat tire or two...LOL. I saw that one "rider" on this site rated this trail very low because it was just too hard for them. That is not the trails fault....it is up to the rider to be up to the task. Believe me...the effort will be worth it!